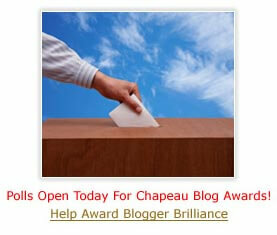 Voting in the Chapeau Blog Awards! began yesterday and eyeflare.com needs your voting love to come out ahead of day-tour juggernaut Viator's diehard fans. Viator and me are in the running for the Most Brilliant Blog award, as well as the honor of the best Travel & Leisure blog for this year's awards. To vote, simply head over to the voting page, and fill in the easy form. As a small incentive for you to vote, if eyeflare.com wins the Travel & Leisure prize, I'll be giving away a Rick Steves Silk Neck Wallet to one person who leaves a comment on this post. Last updated by jack on 15 April, 2009 in Travel News.